January 27, 1901 -- The Chicago Daily Tribune reports that there are only five wolves left within Chicago's limits where once there were thousands. When the great herds of bison on the Great Plains were slaughtered almost to extinction, the wolves that depended on them suffered as well, often turning to the herds of domestic cattle for sustenance. That, of course, only hastened their already tenuous existence as they were hunted ruthlessly with a good gray hide bringing $5 or more. "In America," the paper wrote, "no one renews the game supply and evybody seeks to destroy, blindly, selfishly, unreasoningly . . . There is no other country of equal enlightenment with this which allows its wild game, the property of the whole people, to be stolen for the individual profit of a few." 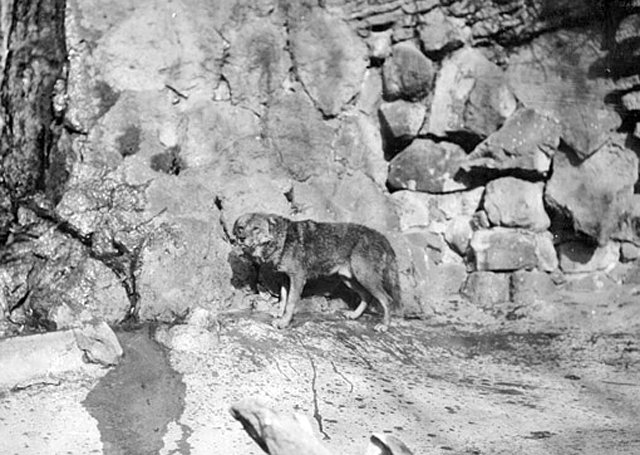 The 1903 photo above shows one of the five wolves in Chicago on display at the Lincoln Park Zoo.